1: Date and Times of Okra Strut? Friday September 28th, 2018 starting around 6pm. We will have live musical performances, amusement rides, food and drinks. 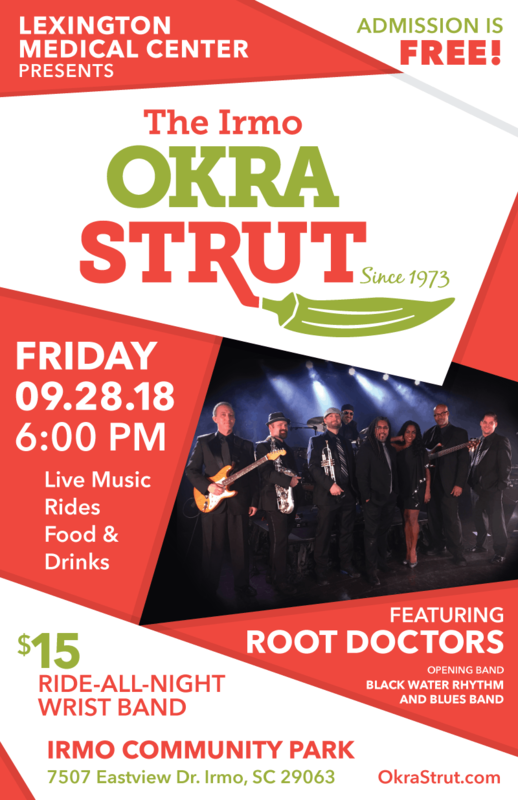 Friday we are excited to welcome back the Root Doctors as our headlining acts! Opening up will be the Balck Water Rhythm and Blues Band. Ride-All-Night wristbands for $15 are back by popular demand. Ride all the rides you want for a price you cannot beat! Lastly we are excited to announce the new addition "Under The Canopy", starting Friday evening, where you can enjoy a fairytale picnic under the trees. Under the trees just beyond the stage we will have tables decorated for a nice dinner, with twinkling lights just over head. You will have a view of the stage in the distance and hear the music at the perfect level for a dinner conversation. As an added bonus, this year all food vendors will be serving until 11pm and they will be offering your favorites right next to local artists and craft vendors. Saturday September 29th 2018. The 45th Annual Irmo Okra Strut Parade will be held around 9am. The Grand Marshals will be Mr. Bill Rigsby an Irmo resident who is the oldest surviving guard of the Tomb of the Unknown Soldier. The parade will be located on St. Andrews RD, between Wescott Rd. and Lake Murray BLVD. Find out about road closures and parking here. 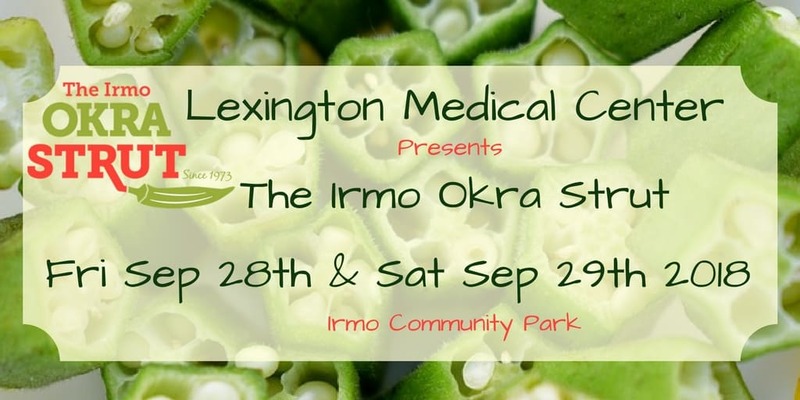 Saturday after the parade starting around 10am the Okra Strut festivities will begin in the Irmo Community Park. There will dozens of vendors and exhibitors for you to stop by and participate. Many will have games or free samples as well as items for purchase. Under The Canopy will be another fun spot on Saturday with free crafting activities throughout the day for children and adults alike! Or enjoy some shopping of local artists for those early holiday presents. The amusement rides will be up and running and we will have attractions on the big stage all day. These attractions include local performances, Okra Eating Contests and lots more. The headlining musical act is The Weight Band featuring members of the Levon Helm Band and The Band with South Carolina's own Rob Crosby as the opening act starting around 6pm. Enjoy dinner Under The Canopy again, a great date night for those who love Americana Rock and delicious food. Irmo Professional Building *Handicapped Parking* Address: 1 Wellness Blvd, Irmo, SC 29063 please use this shuttle for non-folding strollers. Shuttle Buses will be at each location every 20 mins for pick up and drop off. There will be no parking at the park to prevent traffic issues. To save the Digital Parking and Shuttle Map please click here. 3: Is there admission into the Okra Strut? The festival is free to attend. Come enjoy the music, the park and all the exhibitors. Many vendors will charge for goods so make sure to bring money for food, drinks, shopping and amusement rides. We will have ATM’s for your convenience. 4: Can you bring your own cooler? No, we do not allow you to bring your own coolers. We will have food and drink vendors for you to purchase yummy goods from. This event is to raise money for community projects and local scholarship funds so we thank you for understanding and your generosity. 5: Can you bring your pet? 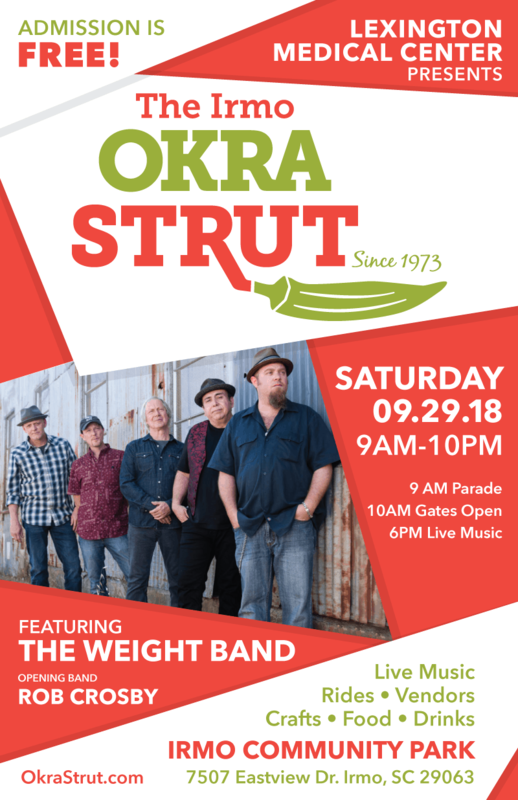 Due to security concerns in the park, NO Pets are allowed in the Okra Strut. 6: Does the Okra Strut have a Beauty Pageant? At this time we currently do not have an Okra Strut Beauty Pageant. Maybe it will be offered in future festivals. 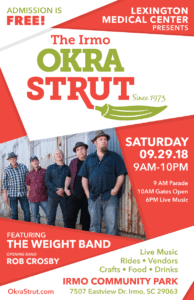 7: How can you participate in the Okra Strut? We are always looking for volunteers. Contact us at info@okrastrut.com to find out how you can volunteer this year!! 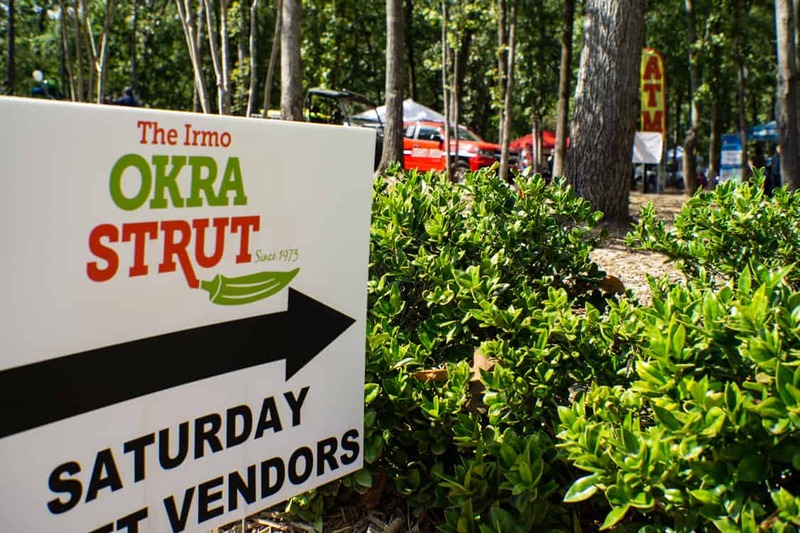 Find out how you can sponsor or be a vendor in the Irmo Okra Strut here!! 8: Can you bring chairs and blankets? There will be seating around the whole park and in front of the pavilion. But you are welcome to bring your own chairs and blankets if you wish. 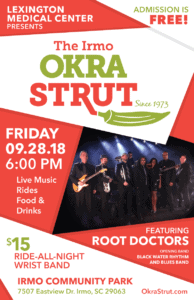 Copyright © 2018- 2019 By the Town of Irmo, SC and the Okra Strut Commission. All Rights Reserved. Use of any content contained herein is expressly prohibited without prior written consent.